While shadowing principal Wanda Perez, Tyra Mariani from the Office of the Secretary interacts with children at D.C. Bilingual Public Charter School. During National Principals Month, senior officials and staff from the U.S. Department of Education spent a day shadowing almost 40 local principals and observing first-hand how their work is impacted by policy. 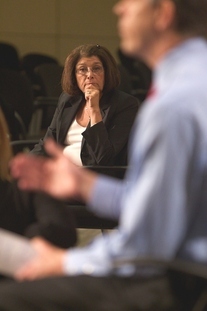 During their visits, ED officials witnessed a myriad of principals' experiences and gained insight into the range of issues principals confront daily. Many saw principals observing teachers and students in classrooms, leading staff meetings, guiding cooperative learning teams, supervising bus lanes and cafeterias, attending soccer games, participating in professional development, analyzing school data, soothing crying children, consulting with technology specialists, cleaning up vomit, writing educator evaluations, and talking with students, teachers, custodians, coaches, and parents about their individual concerns. Somehow there was also time to talk about national, state, and local education policy and to gain advice from administrators. In a post-shadow debrief with Secretary Arne Duncan, the principals offered their insights about how the U.S. Department of Education can better serve school needs, and ED officials shared what they learned. See the list of participants. Read the blog post. Time Well Spent offers an in-depth examination of 30 expanded-time schools serving high-poverty populations with impressive track records of student success and demonstrates how these schools leverage their additional time in order to implement other critical reforms. 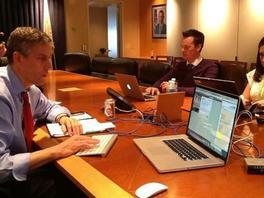 Archived Webinar: Data Use and Common Core Planning in School Turnaround: Focus on Mathematics. The Comprehensive Planning Template offers key actions in the development of a comprehensive and coherent plan for using achievement data to support instructional decision-making. It covers such topics as leadership, standards and expectations, research-based instructional practices, classroom instruction, teacher quality, families and the community, and data use. The Center for Public Education has published a report connecting certain high school conditions with later success in college. The study cites three factors that most contribute to student post-secondary success: receiving strong academic advising, taking high levels of math, and taking AP and/or IB classes. Even when students fail the end-of-course test, taking an AP/IB course had a dramatic effect on students’ chances of completing college. According to the report, "Low achieving and low-income students who took an AP/IB course were 18 percent more likely to persist in four-year colleges and 30 percent more likely to persist in two-year colleges. The more courses a student took, the higher their persistence rates." Read the report. What is the State of Education In America? "Some educators feel overwhelmed by the speed and pace of change. Teachers I speak with always support accountability and a fair system of evaluation. They want the feedback so they can get better and hone their craft. "But some of them say it’s happening too quickly and not always in a way that is respectful and fair. They want an evaluation system that recognizes out-of-school factors and distinguishes among students with special needs, gifts and backgrounds. "They certainly don’t want to be evaluated based on one test score – and I absolutely agree with them. Evaluation must be based on multiple measures." Read the entire speech here, and watch the video from C-SPAN here. On October 12, Arne Duncan held "office hours" to answer questions from students about the Free Application for Federal Student Aid (FAFSA) in a Twitter Town Hall. Check out the questions and answers. The Department has a new web page for parents and families. Topics include parental involvement in schools as set forth in Section 1118 of Title I of the Elementary and Secondary Education Act, special education, fatherhood, early learning and bullying. There are also resources for military families, tools for selecting a college and paying for it, and tips for how parents can help children to succeed in school. Arne Duncan answered questions at Twitter Education Forum in Miami, Florida, hosted by NPR's Michel Martin. During the interview, Duncan urged the nation to elevate the teaching profession, including paying and respecting teachers much more. Listen to a 5:47-minute excerpt, where he takes on tough issues such as testing, NCLB, and poverty. His message that "we have to get serious about the opportunity gap" was retweeted more than 200 times. Duncan also made an appearance on the Diane Rhem show, where he talked about helping teachers to reduce their debt. Free College Prep Checklist. Download this “to do“ list for your students from elementary school through high school. This free guide will help students prepare both academically and financially for education beyond high school. Each section is split into subsections for students and parents, explaining what to do and which publications or websites might be useful. Crank Up Your Wake Up! Get Schooled lets students sign up to get wake up calls any day of the school week from celebrities such as One Direction, Nicki Minaj, Ciara, and Wiz Khalifa. 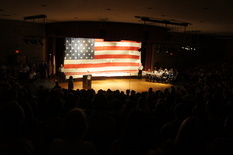 Read the story about how a fragmented flag from 9/11 was put back together and how the flag's story affected a school in Allendale, N.J.
Teachers go above and beyond every day. They are selfless. They are courageous. They do the extraordinary. Now is a chance to honor educators' commitment through the Citizen Service Before Self award. Nominate an unsung education hero that you know. More information. "Classy" Pictures. Check out Classroom Portraits Project. The site offers photos of classrooms around the globe. Begun in schools in North East England in 2004, the archive has grown to include schools from North and South America, Europe and the Middle East. Teachers Share Rewarding Moments. Monday we asked teachers on Twitter to tell us the most rewarding thing to happen in their classroom so far this year. Several of the responses were too good not to share with everyone. Read the responses on Storify. It's Never Too Late to Learn. Read the story of two convicts who returned to school in Iowa and gained the skills to re-enter the workforce and build new lives. Teacher Kudos. People magazine has named 5 Outstanding Teachers of the Year. Seeing Student Potential--and Checking Assumptions at the Door! A blog article written in EdWeek by Anthony Rebora reminds us not to discount the potential of any of our students. Read "Nobel Prize-Winning Scientist Written Off by Teachers." Opportunity for Science Teachers. Applications for the prestigious Einstein Fellowship are being taken through December 5. The goal of the Einstein Fellowship Program is to provide an opportunity for teachers to inform national policy and improve communication between the K-12 STEM education community and national leaders. Educator, school counselor, and mom of four, Becky Mladic Morales, aims to increase global and cultural awareness through her blog, Kid World Citizen. Morales shares the educational activities that she has gathered from around the world and developed for her students and her own children. Organized by topic and by country, she offers art projects, reviews on multi-cultural children's literature, information about international heritage and celebrations, among many other fun activities that you can use with students. Teaching Ahead is an interactive roundtable blog project jointly developed by Education Week and the Center for Teaching Quality. The blog is designed to bring greater exposure to the ideas of standout classroom educators on the future of their profession. Each month, selected teacher panelists will be asked to respond to and discuss key issues in education policy and instructional practice. We like an article by Noah Patel on Boston's Teacher Leader Training Program and another on the importance of authentic professional for mentors. In a new report called "The Competition that Really Matters," the Center for American Progress looks at the educational progress being made in China, Europe and India, including "ramping up investments and carefully investing in strategies that make it possible to see annual progress toward their goals." It concludes that the United States shoud renew its commitment to education and practices that "train and sustain highly effective teachers.